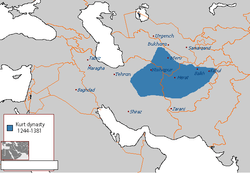 The Sarbadars (from Persian: سربدار‎‎ sarbadār, "head on gallows"; also known as Sarbedaran سربداران) were a mixture of religious dervishes and secular rulers that came to rule over part of western Khurasan in the midst of the disintegration of the Mongol Ilkhanate in the mid-14th century (established in 1337). 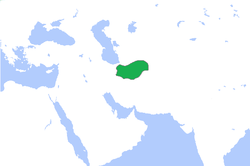 Centered in their capital of Sabzavar, they continued their reign until Khwaja 'Ali-yi Mu'ayyad submitted to Timur in 1381, and were one of the few groups that managed to mostly avoid Timur's famous brutality. Sheikh Khalifa Mazandarani one of the leaders of this movement was indeed a great scholar. In modern Iranian history the term "Sarbedars" was used by the Union of Iranian Communists (Sarbedaran) during their armed uprising in January 1982 in Amol against the Iranian regime. The Sarbadar state was marked by divisions in religious belief during its existence. Its rulers were Shi'i, though often Sunnis claimed leadership among the people with the support of Ilkhanid rulers. The leadership of the Shi'is stemmed chiefly from the charisma of Sheikh Khalifa; a scholar from Mazandaran, the shaikh had arrived in Khurasan some years before the founding of the Sarbadar state and was subsequently murdered by Sunnis. His successor, Hasan Juri, established the former's practices in the Sarbadar state. The followers of these practices were known as "Sabzavaris" after the city. The Sabzavaris, however, were divided; among their number were moderate Shi'is who were often at odds with the dervishes, adherents of a mystic ideology. The capital city of Sabzavar likely had a large Shi'ite community, but as the Sarbadars conquered the neighboring territory, they acquired cities with Sunni populations. The Sarbadars are unique among the major contenders in post-Ilkhanid Persia in that none of their leaders ruled as legitimate sovereigns. None of them had a legitimate claim to the Ilkhanid throne, or were related to a Mongol or any other royal house, and none of them had previously held a high post within the Ilkhanate. While they on occasion recognized claimants to the Ilkhanid throne as their overlord, they did so purely as a matter of convenience, and in all other aspects they had no ties to the Ilkhanate. This fact had a strong influence regarding the nature of the Sarbadar political state. The Sarbadars had a form of government which would, in modern times, probably be identified as an oligarchy or a republic. Unlike their neighbors, the Sarbadars had no dynastic lines; power usually went to the most ambitious. This view is not universally held, however. Some point to the fact that one of the Sarbadar rulers, Vajih al-Din 'Mas'ud, produced a son who also eventually reigned, named Lutf Allah. While seven other rulers separated the reign of Mas'ud and that of his son, those seven rulers are sometimes considered regents for Lutf Allah, until he was old enough to grab power for himself. Nevertheless, the seven are generally considered the heads of state in their own right. A ruler would hold power for as long as he could; the fact that several of them met violent deaths was a sign of the instability that plagued the state for most of its existence. The founder of the Sabadar state, 'Abd al-Razzaq, used the title of amir during his reign. While many of the Sarbadar leaders were secular, the dervishes also had their turns in power, and on occasion they ruled the state in co-dominion with each other; such partnerships, however, tended to fall apart quickly. Because the two sides held radically different views on how the Sarbadar government should be run, there were often drastic changes in policy as one side would supplant the other as the most powerful.